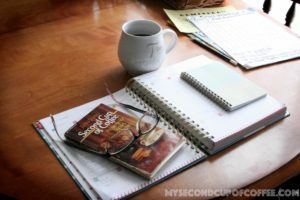 The name for my blog came to me a while ago as I sat one morning at my kitchen table with a sigh of relief that all moms can relate to: finally, the breakfast was finished, my kids were occupied with their toys and projects, and I…Well, I was able to slowly enjoy a little time to myself…Right next to me was my little devotional book on Proverbs I had picked up at a thrift store…It was a collection of encouraging prompts to look to the Bible to find wisdom and purpose for busy mothers…I didn’t read it every morning, but when I did, it surely made a big difference in my attitude for the day. I hadn’t really paid attention to the book’s cover until that morning when my eyes lingered for a second longer on the cover as I was sipping my coffee. 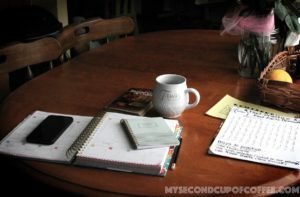 Second Cup Of Coffee by Jean Shaw…Huh! 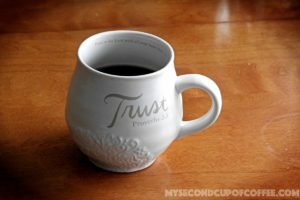 While having my second cup of coffee is usually the time when the “magic” happens…I have a blissful QUIET time of prayer and devotions, scheme great plans, dream big dreams, and dig deeper in my heart to seek balance and wisdom in my life. A lot of the projects, plans, and ideas, and just random thoughts that will be shared here started/were generated during my favorite time, the time of my second cup of coffee! Welcome and enjoy looking around! If you wish to stay in touch, feel free or subscribe to my newsletter or to the RSS feed! What a great name for a blog. Good luck in your blogging adventures. This looks like a great blog and a great Blog name. Find it so interesting that it came from the name of a book. I love devotional books. Thank you for putting your blog out there. I found you through the link party from Raising Independence blog. I hope to keep up and encourage you in your journey. Hi, Melissa! Thank you so much for stopping by and for your kind words!! You are so sweet 🙂 It’s kinda scary to put yourself out there, but I hope that my stories will be encouraging and helpful to others. The funny thing is that I heard about it but never posted in that link party! I wonder how my blog popped over there?? In anyway, I’m glad you found your way over here and said “hi”!